This home features 2 bedrooms, 2 bathrooms and a den, in 2,574 square feet of living space. Options includes a 2' garage extension, an exterior fireplace on the rear patio, paver walkway and driveway, a golf cart garage, bow window in the cafe and owner's suite. Inside you will find, a den, upgraded kitchen cabinets, granite counter tops, stainless steel appliances including, cook top, canopy hood, micro/oven combo, dishwasher and refrigerator. This home features 2 bedrooms, 2 bathrooms and a den, n 1,884 Square Feet of living space. Options include an in-ground pool, bay window at the owner's suite, leased 4.0 Kw Solar System. Inside you will find the AV built in with fireplace, upgraded kitchen cabinets, stainless steel appliances including, range, micro hood, dishwasher, refrigerator and the washer and dryer are included. 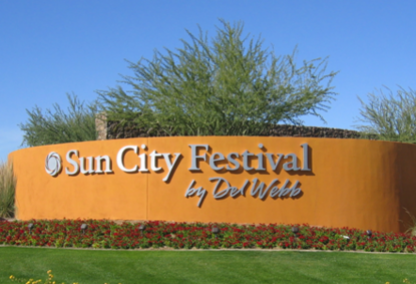 Check out all available homes for sale in Sun City Festival, in Buckeye AZ. Use the home search below to see all available homes for sale in this active adult community. Let us know if you need any assistance in your home search; one of our local Sun City Festival Realtors would be happy to answer any home buying questions you may have. We would welcome the opportunity to assist you with your search for a new home in Sun City Festival. What's My Home In Sun City Festival Worth Today? Let me know what type of home you are looking for in the Sun City Festival area, and I'll be glad to answer any questions, give you a comparative home value analysis and show you any MLS property listing of interest. Contact us today! Listing information last updated on April 21st, 2019 at 5:32am PDT.